Curated by Anna Louise Richardson, Worth Its Weight In Gold investigates the idea of an idyllic rural lifestyle through the works of Western Australian artists Geoff Overheu, Valdene Buckley, Paul Caporn, Abdul-Rahman Abdullah, Roderick Sprigg, Anna Louise Richardson and furniture designer maker Megan Christie. Creating a forum for discussion, the project is a vehicle to reflect upon the mythologies of what it means to be a rural or a city dweller in Australia. 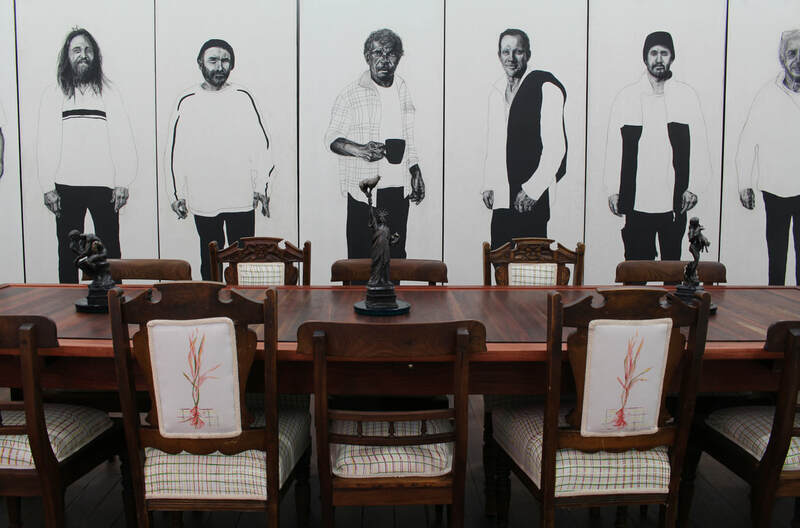 In this exhibition, Australia’s rural history is experienced by its audience within the historical precedent of a dinner party taking place in a gallery setting. Using the Victorian era model of inviting people to dinner specifically to view a new artistic acquisition, this exhibition creates a forum to explore how Australian historic idealism translates within a contemporary, cosmopolitan setting. 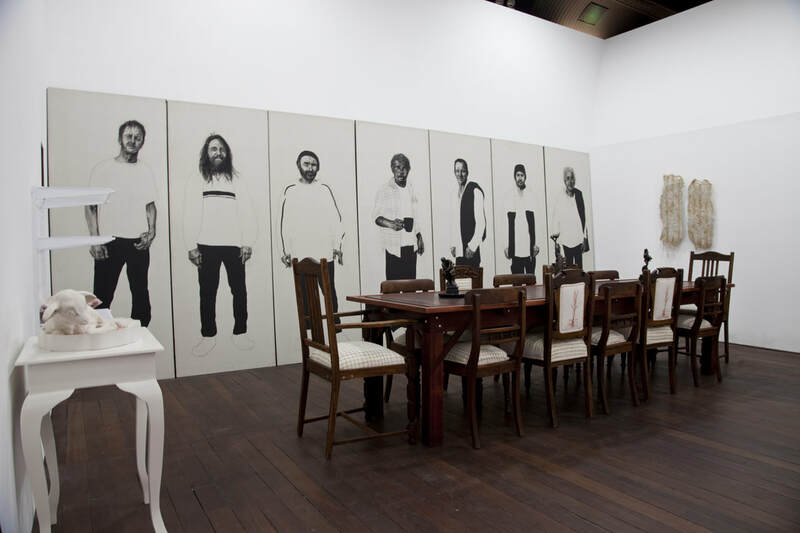 Allowing the opportunity to initiate meaningful dialogue over shared community experiences, Worth Its Weight In Gold comprises an exhibition and series of long table dinners to inform and relate the implications, history and myths of the sheep industry through art. Moana Project Space, Perth, WA. 23 May - 20 June 2014. Geoff Overheu is a sculptor and installation artist, whose interest is in the romanticisation of the rural landscape. Overheu grew up on a wheat/sheep farm in the Central Wheatbelt, 250kms north of Perth. Depending on the vagaries of the season he ran 4,000-6,000 head of sheep in a self-replacing flock. He was a wool classer, crutcher, muleser and has been known to shear the odd sheep. He has recently had a solo shows at Geraldton Regional Art Gallery and Bunbury Regional Art Gallery. As well as having work in Strand Ephemerain Townsville at the Perc Tucker Gallery, and the Adelaide at the Festival Hall as part of the Adelaide Fringe Festival. Overheu will be spending April, May and June, 2014 in a Residency in Beijing, China in conjunction with the Red Gate Gallery, looking at farmers and the urban/rural divide in China. Valdene Buckley is an emerging visual artist whose work addresses notions of memory embedded in objects and places. She works in a variety of media underpinned by printmaking processes to record changes in matter that occur over time. In developing art that seeks to communicate the transient, ephemeral qualities of memory and matter, she produces site-specific works that record the present but also reference the past. In this work, Buckley to some extent acts as a facilitator, using the natural elements to make the marks that provide evidence of how people and matter interact in local environments. Buckley grew up on a wheat and sheep property near Yorketown in South Australia before her family relocated to a new farm her father had developed from virgin bush at Wellstead, on the south coast of Western Australia. The new land farm was very much a family affair and she grew up drenching, needling, mulesing, and at various times worked as a cook, roustabout and classer during shearing. It was accepted practice for her father to schedule sheep work around her school weekends and university holidays. Her siblings now farm the family properties and she visits regularly. There was a time in the late ‘60s when her father predicted he would be a millionaire within ten years, based on the wool prices that were then current. Sadly, wool sheep once critical to the farm income have become progressively less important. Her work for this show responds to this, utilising materials such as wool, rust, wire and iron to weave together this narrative of her history. Buckley has exhibited in group and solo exhibitions including Time ... Tide, Freerange Gallery, Perth, The Matter of Memory, Honours Exhibition, Cullity Gallery, UWA and the Fremantle Print Awards, Moores Building, Fremantle. In 2013 she was awarded the Mossenson Galleries Prize for Creativity and will be exhibiting in HATCHED 2014 at PICA. Paul Caporn’s work often engages with ideas that circulate notions of industry and science. Dealing with technologies in what is often a low-tech manner; describing the relationships between people, memory, time, space and places.This is often negotiated through an uncanny sensibility, where familiar domestic or industrial objects are brought together in a way that feels both comfortable and unfamiliar. His work in this show connects with his family history and relationship with his uncle, who continues to run the family farm in Darkan, near Kojonup, Western Australia. Struggling between the forces of nature and finance his uncle lives an isolated existence negotiating a battle between historical and contemporary farming practices. Caporn has exhibited nationally and internationally in over 40 group and 9 solo exhibitions, making art primarily in the realms of sculpture, animation, video and installation. Recent group exhibitions include Impacted at the Art Gallery of Western Australia, and Now and Then, at Curtin University in 2013. In 2014 he will undertake a 6 month arts residency in Basel, Switzerland, through Artsource and the Christoph Merian Foundation Switzerland. He has been the recipient of various grants from Department of Culture and the Arts WA, including a Visual Arts Craft Strategy Mid-Career Fellowship in 2008. Currently he is working towards an exhibition at John Curtin Gallery for which he received an Australia Council development grant for in 2013. Abdul-Rahman Abdullah’s practice explores definitions of cultural identity, focusing on memory, narrative and the domestic environment to access esoteric social histories within an urban Australian environment. Abdullah’s interest in defining identity in experiential terms emerges from a Muslim heritage that is both seventh-generation Australian and Malay. The overlaying of divergent cultural and historical influences inform Abdullah’s outlook, giving him the impetus to investigate ideas of alterity and the elusive nature of belonging. The idea of subjective reconstruction is essential to Abdullah’s practice, clarifying formative passages of personal history in ways that can be experienced by an audience. Creating a physical dialogue with the past allows him to explore some of the more opaque aspects of a Muslim upbringing in an urban environment, referencing ideas of spirituality, domesticity, multi-ethnic identity and the arcane in equal measure. Re-imagining the real becomes a process of translation; an exercise in which the passage of time plays a central role determining the resonance of the past through an imperfect lens of nostalgia, intuition and the inevitable baggage of adulthood. Abdul-Rahman Abdullah’s contributions to Worth Its Weight In Gold offer a glimpse into the social and cultural values of sheep in terms of halal slaughtering practices experienced during his childhood in the inner suburbs of Perth. Conflating religious observation with a love of both pets and food, Abdullah invites us to experience them all on the same plate. Attending the Victorian College of the Arts in Melbourne, then Curtin University Abdullah graduated from art school in 2012. In 2013 he was awarded a Development Grant from the Department of Culture and the Arts, the Artstart Grant from the Australia Council and selected for the Artsource Emerging Artist Program. He was a finalist in the Blake Prize, Substation Prize, Fisher’s Ghost Art Prize and was the West Australian recipient of the Qantas Foundation Emerging Artist Award. He is currently undertaking a Jump Mentorship with Sydney based artist Alex Seton. Abdullah is commercially represented by Dianne Tanzer Gallery + Projects (VIC) and Venn Gallery (WA). Upcoming shows in 2014 include Public Form Project (WA), Tropaeum Fremantle Arts Centre (WA), The List Campbelltown Arts Centre (NSW) and Melbourne Art Fair with Dianne Tanzer Gallery + Projects (VIC). Anna Louise Richardson is an emerging West Australian contemporary artist whose practice focuses on rural identity in a modern Australian environment. Working primarily in painting, drawing and installation, her approach draws on figurative depictions and personal narratives that expose her set of beliefs and discusses our relationships with animals, the land and the fundamentals of life. Richardson’s practice seeks to reconcile a relationship with the environment through an underlying sense of the practical realities of a farming lifestyle. Her work in this show draws on her childhood experience of shearing. Shearers are a deeply imbedded part of Australia’s history; with most images of shearers focusing on the work they do. Her work is based on the shearer at rest, having ‘smoko’, with the focus on the shearers themselves, their hands and faces. The works look at shearing in a nostalgic vein and explore the people behind this iconic masculine vocation. Recent projects include a solo exhibition As I see it, Kurb Gallery-Perth, Curtin Degree Show, Curtin University-Perth, Inception, Preston Street Art Space-Perth, and participating in the Proximity Festival LAB, Perth Institute of Contemporary Art-Perth. She has been selected for 25 under 25, an exhibition of 25 of Western Australia’s most talented young artists under the age of 25 to be held at the Moores Building, Fremantle in April. Richardson is currently undertaking a Masters of Cultural Material Conservation and aims to have a three-fold practice of artist, curator and conservator. Megan Christie’s practice is the design and creation of fine furniture as functional art pieces. She is interested in environmentally sustainable modes of production that express her beliefs about how we respond to the use of natural materials and farm our surroundings. Her work reflects a strong belief in ecologically sound solutions, that beautiful pieces of art can be created from sustainable materials, salvaged or recycled local timber, and that pieces should be designed for longevity. She reinterprets traditional craftsmanship to express her connection to the land and environment using artistic practices not commonly associated with the production of furniture. Christie’s workshop is an old farm shearing shed. Her work for Worth Its Weight In Gold is invested with the spirits of sheep long ago shorn and often incorporates some of the jarrah recycled from the wool bins. This project continues the reincarnation of her sheepish past; the dining table for the long table dinner events will be inspired by, and largely made from, the old wool sorting table. Recent group exhibitions include Singularity, Kurb Gallery-Perth, Align, Preston Street Art Space-Perth, Inception, Preston Street Art Space-Perth, and Soup Collective Inaugural Exhibition, MRA William Street-Perth. Christie has been the recipient of various awards from the Australian Furniture of the Year Awards in 2009 and 2010. She has been published in 500 Cabinets – A showcase of Design and Craftsmanship, Lark Books and was awarded the Highly Commended Regional Award at the Mandjar Art Awards-Mandurah in February. Worth Its Weight In Gold, 2014, installation view. Megan Christie, The Wool Table, 2014, recycled jarrah wool table, 320 x 93 x 78cm. Megan Christie, The Chairs, 2014, reclaimed chairs, screen-printed calico, dimensions variable. ​Anna Louise Richardson, The Shearers, 2013, conte, black gesso on Hardieflex, 204 x 630cm. Valdene Buckley, Labour Of Love, 2014, hand spun wool, resin, wax on acrylic, 90 x 70cm. Geoff Overheu, Untitled I, 2014, bronze, glass, 25 x 10cm. Geoff Overheu, Untitled II, 2014, bronze, glass, 25 x 10cm. Geoff Overheu, Untitled III, 2014, bronze, glass, 25 x 10cm. Geoff Overheu, Two Dreamers Hugging, 2012, plastic, animatronics, sand, steel, enamel paint, 180 x 70 x 55cm. Abdul-Rahman Abdullah, Waiting For Dad, 2011, tinted silicone, urethane, shelving, 77 x 67 x 39cm. Abdul-Rahman Abdullah, Eulogy, 2011, tinted resin, timber table, 100's & 1000's, 60 x 50 x 90cm. Roderick Sprigg, Foster A Lamb, 2014, wool, timber, certificate, brochure, mirror, dimensions variable. Paul Caporn, Incident With A Memory, 2014, neon, resin, timber, media player, dimensions variable. Worth Its Weight In Gold is supported by the Government of Western Australia Department of Culture and the Arts, Moana Project Space, City of Perth through their Arts and Cultural Sponsorship and as a partner of the 2014 City of Perth Winter Arts Season.